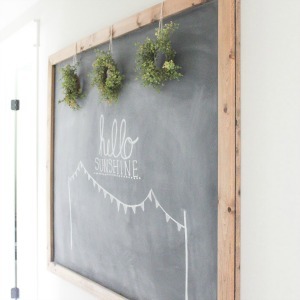 Today on 10 Minute Decorating we are all about summer and making it easy! 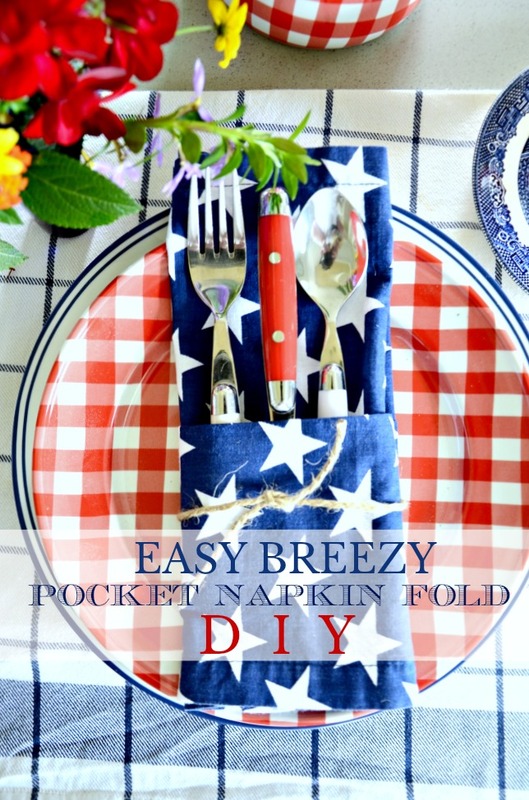 And I’m sharing a super easy peasy breezy way to fold a napkin into a pocket for utensils. Once you get the hang of creating a pocket napkin, you can whip out enough for a party in 10 minutes! How cute would this be for your next bbq or picnic? Let’s make it in 10 minutes! Today’s Decorating Tips And Tricks podcast is all about CREATING A WELCOMING FRONT DOOR! We have lots of tips for making your front door the envy of the neighborhood… and very welcoming too! Check out all 56 podcast episodes HERE. 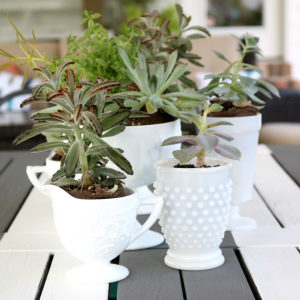 Today is 10 MINUTE DECOR…THE SUMMER EDITION! 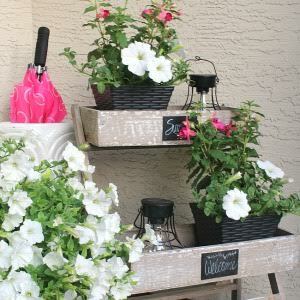 Make sure to see the great summer ideas at the end of this post. 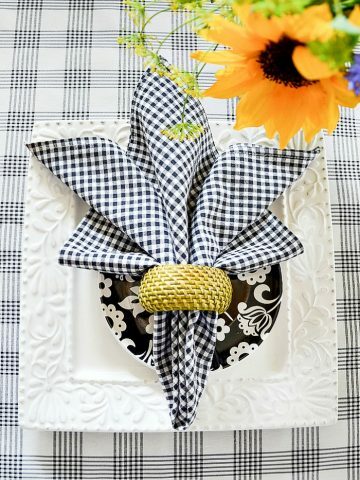 Grab and napkin and learn how to make this really cute napkin fold! 1. Spread the napkin right side up on a flat surface. 2. Fold the napkin in half, wrong sides together. 3. Take the top layer and fold it down to the fold line on the bottom layer. The top layer will now have a fold line in the middle of the napkin. 4. Turn the napkin over. Be careful that it stays folded. 5. Fold over the right side 1/4 the length of the napkin. 6. Fold it over again so the left edge of the folded part touches the center line of the napkin. 7. Fold the left side over a little more than 1/4 width. 8. Fold the left side over again, matching the far edge. Tie a jute string around the napkin just below the fold and insert utensils into the fold. 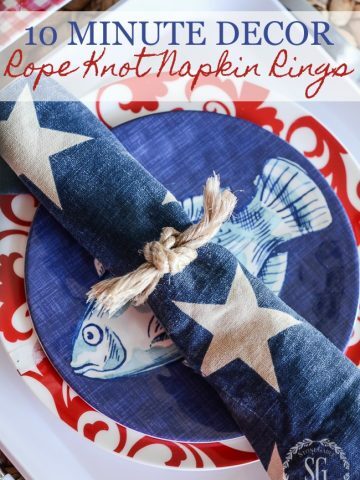 I hope these fun napkins will show up on your summer table! Great napkin, table setting & outdoor summer decor! Always beautiful & great ideas. Even the little twine around adds nice touch. Thanks for your time & efforts in sharing with us? 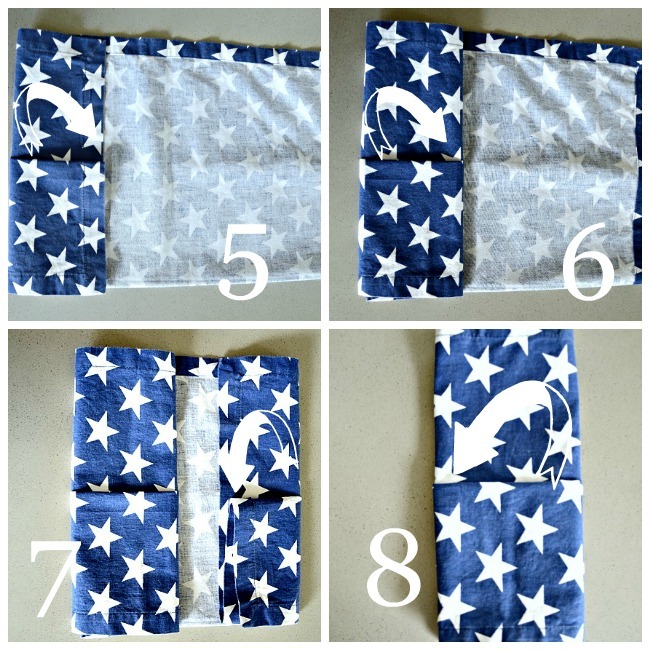 I love those napkins and will try this fold soon! Definitely pinning for the future. You did it again! This is what a calm guest bedroom should look like! My house is in need of changes so your tips helped me so much. I’ll 1st paint the guest room white. That alone will give the room a different look but I’ll need to remove everything and only add pieces I really want. Thank you for our ideas as changes are overwhelming to me. This is a great start. That is very quick, indeed! Thanks for the tutorial! I am going to have to try this sometime soon. I am going to try the napkin folding for my Bunco party in July. It is great! Easy and peasy! So cute!!! 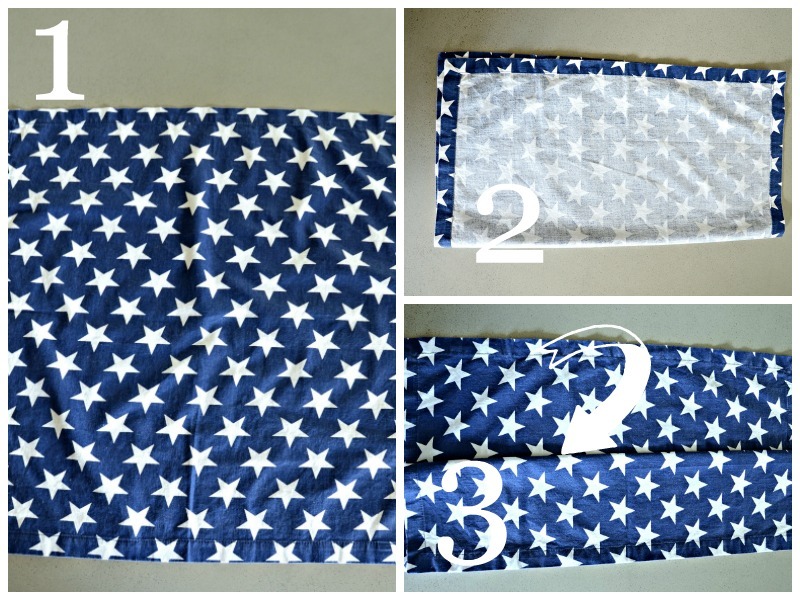 we do not use fabric napkins but I like to use them for making pillows and your napkin would make a cute 4th of July pillow. Hi, Yvonne! 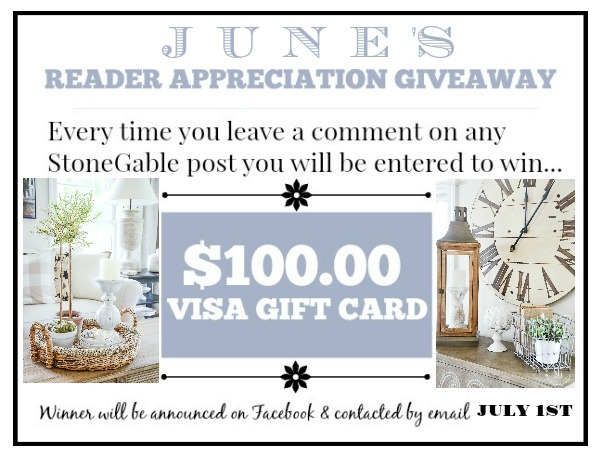 As a daily reader, I want to let you know I have not received a post or podcast since June 7th. I am having withdrawal symptoms! Seriously…just wanted to see if the problem is at my end. Hope all is well with you! Maybe a new granddaughter has arrived a little early! Thank you for sharing the quick and easy napkin fold tutorial. I saw a similar one at a wedding recently and was trying to figure out the steps! Happy Friday…. Love, love, love these pocket-fold napkins. We folded bunny ears for Easter and these will be perfect for the Fourth!!! I love clever napkin folds, although some take some practice for me lol! What a great way to keep everything organized and bring a fun pop of colour to the table top! 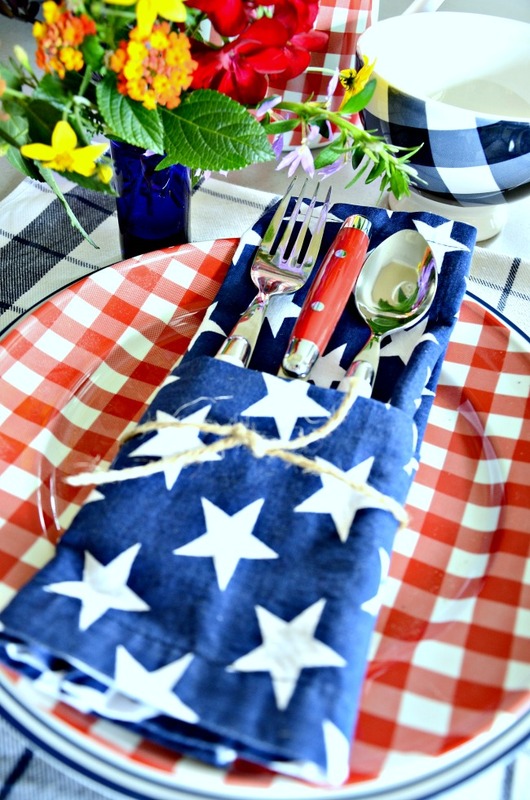 I LOVE patriotic decorating, especially on the table! Thank you for this inspiration. Love this idea! I’ll be using it for our 4th of July BBQ. This idea make me want to use the smoker. 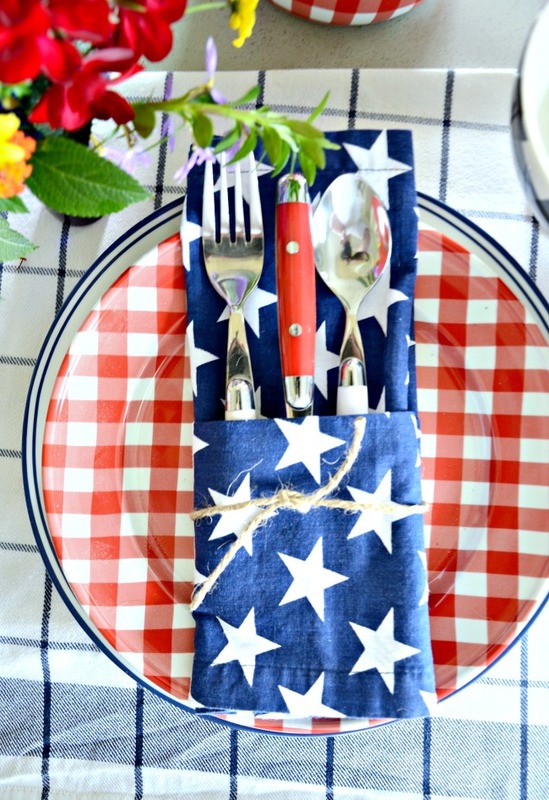 I can taste some delicious pulled pork served at a great patriotic-themed table! In step 2, I think it should read “right sides together”. At least that’s the way it’s shown. On our next picnic I will be taking the utensils in these napkins! Such a clever idea. Red White & Blue is an eye catcher, that I never tire of! Great easy directions thanks. Love the gingham dishes as well as other gingham pieces I’ve seem in the past. Would love it if you did a post on all your gingham dishes , cups etc… And where to purchase them. I bought a large red and white gingham bowl at Home Goods a week ago. Love it! This is adorable and so festive, thanks for the great tutorial! I love cloth napkins and have them in an array of patterns and plain. Every time I go into a store seems like I gravitate to the linens. I’ve been really lucky to pick up some beautiful napkins at Pier I (on sale) and not so much Home Goods they are always picked over. Your design tip is so much fun it’s so easy once you get it down you can almost do it blindfolded. Yvonne where did you find those darling dishes-loving them too. I love it, and I think I can do this! Thank you. It’s so cute! 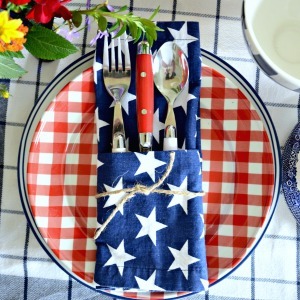 Love the napkin and the red and white utensils! Awesome!! I think I can do that! Thank you! I love this! I have been trying to fold our napkins nicely for some time and I finally went to the napkin rings because every time I tried they turned out terribly! I am so glad you posted this to help! 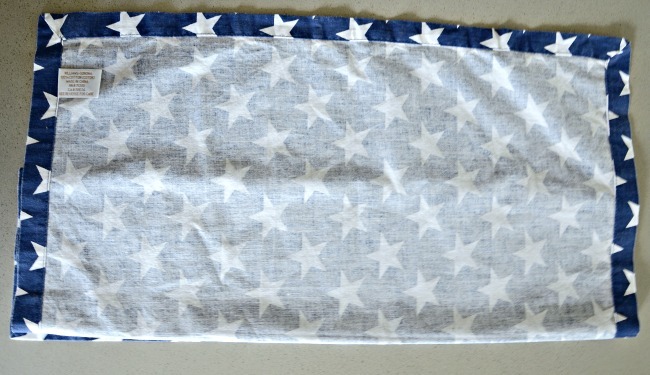 Also the napkins are so classy and perfect for the 4th! Clever idea! Looking forward to summer fun! Thanks for the idea. Looks easy enough that even I could do this! Pinned it! I will definitely use this technique. A great way for a napkin fold. I will definitely pin this one. 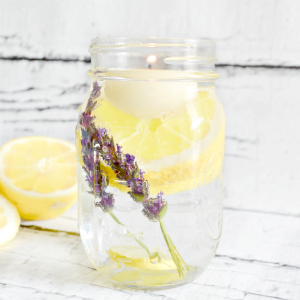 So clever and simple…really dresses up the table! 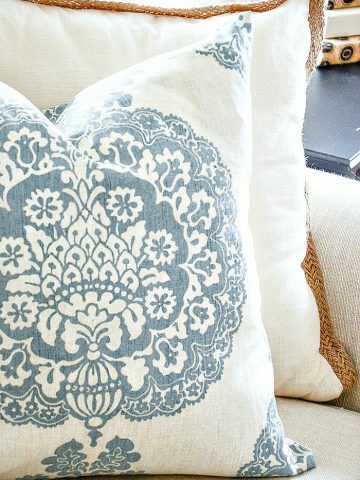 I’ve always loved this look, and you can find wonderful cloth napkins at Home Goods. Thank you!!! I’m definitely going to practice this. Thanks for the tip! I will be using this for my daughter’s backyard birthday party. I will certainly save those napkin folding instructions. We use cloth napkins alot.